We've written in the past here and here about some of Tampa's plans and activities around Complete Streets. As a refresher, a "complete street", according to Smart Growth America, "are designed and operated to enable safe access for all users, including pedestrians, bicyclists, motorists and transit riders of all ages and abilities." There is no single design approved for complete streets, and they may vary by neighborhood or community. Urban complete streets may be different than suburban or rural streets. Generally, it's about livability. I'll leave the definition of livability as an exercise left for the reader. We like riding our bikes. 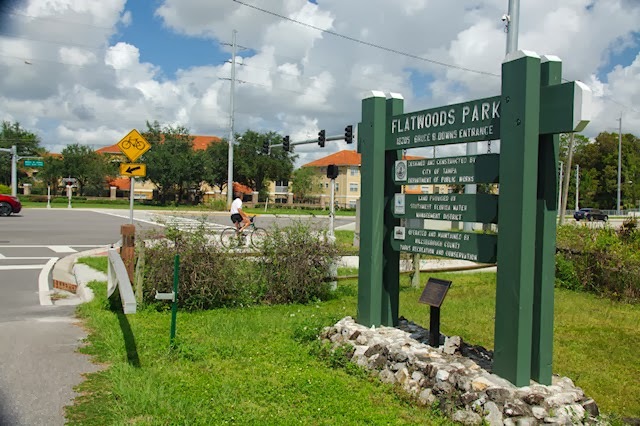 We bike often on the bike trails -- Suncoast and Flatwoods -- but are not bold enough to ride on the roads in our neighborhood too often. It is something we would like to be able to do -- run to Publix, the drug store, grab a meal, etc. just hop on the bike. But do others think the same way? What do people do who live in communities that are more bike friendly? What are some complete, or nearly so, complete streets and neighborhoods around Tampa? Where have we made the streets more inviting for pedestrians, bicyclists and not just cars? So lets look around a bit. Perhaps New Tampa. 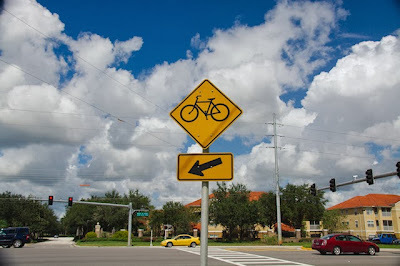 New Tampa has miles of bike lanes -- not just sidewalks, not just shared bike lanes on the roads, but separate, nicely paved and maintained bike lanes that run from about Skipper Road and Bruce B. Downs, north past Hunter's Green, and several miles of bike lanes in the neighborhoods. 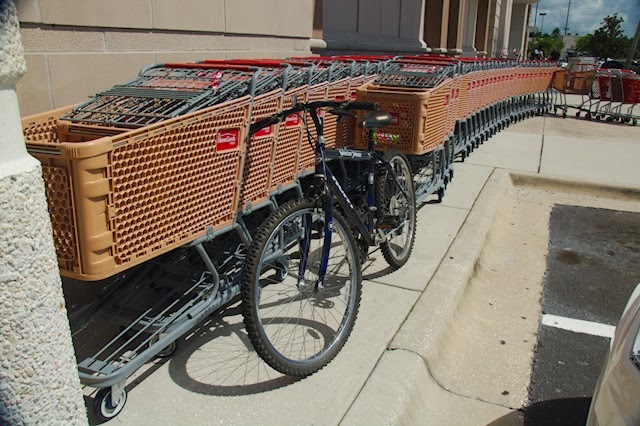 Retail, groceries, dining are all easily accessible via the bike lanes, many within a 5 - 10 minute bike ride from nearby New Tampa communities such as Tampa Palms. So let's see how many bicyclists were taking advantage of their nearly complete streets on a recent beautiful Fall early Saturday afternoon. There were a few bikes at the New Tampa Y. But there were quite a few more cars. 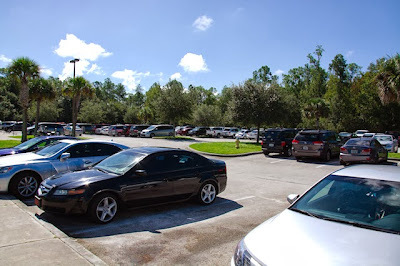 This is about 1/2 of the parking lot., which was pretty full. Let's go grab a bite to eat at Panera. These were the only bikes I spotted while at Panera. 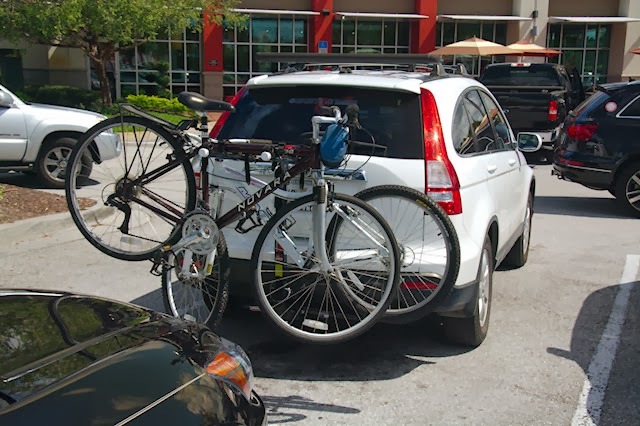 Perhaps at the nearby bike store? Hmm.... I did not see anyone on a bike at the bike store. I did see someone walk a bike out shortly after this shot and rack it up on their car. Not yet discouraged, I did find another bike at a nearby retailer. Let's move on to Flatwoods, a nearby Hillsborough County park, with a 7 mile loop popular with bikers. I did see a few bikers there, but it was a rather light crowd compared to other times when we've biked at Flatwoods. Bike paths in the area a clearly marked. No motor vehicles are allowed on the bike paths. No too many bikers either. But there where quite a few more cars on the roads. How about Publix down the road? 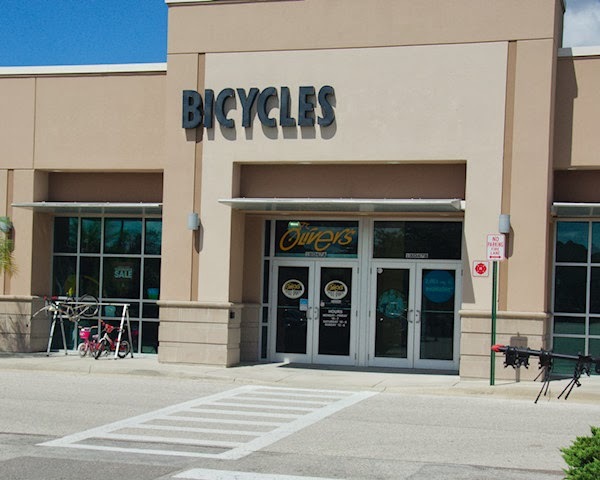 It's right in the heart of Tampa Palms, at most 10 minutes by bike from Flatwoods. I can't imagine where all the bicyclists are on such a beautiful day. 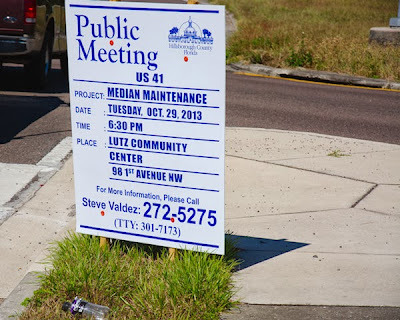 Tampa Palms is not the only community in the area to feature attributes of Complete Streets. 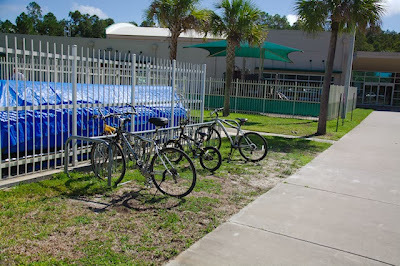 About 10 minutes away by bicycle, USF will be getting one soon as well. 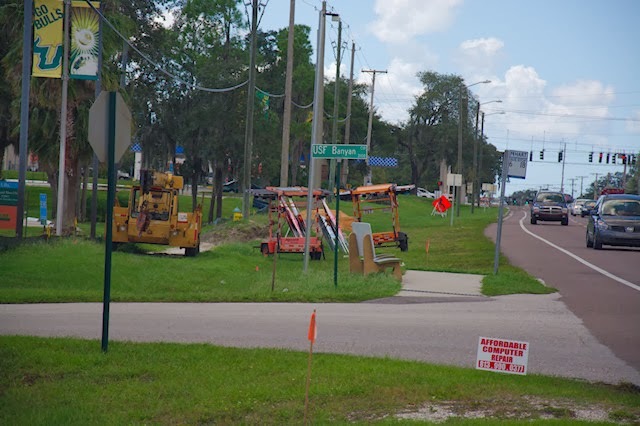 Fletcher Avenue east from Bruce B. Downs to 50th Street has started work to become a complete street with a $5.4 million project. 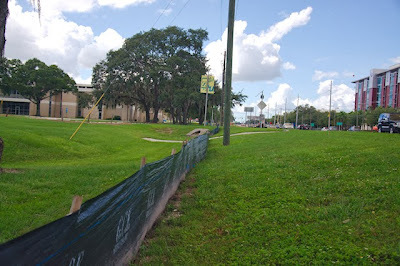 Sure, they're making Fletcher more friendly for pedestrians and students, but it will impede traffic on that already busy corridor. Tampa also made over North 22nd Street, including a new roundabout, for about $5.6 million as part of a Complete Streets effort. 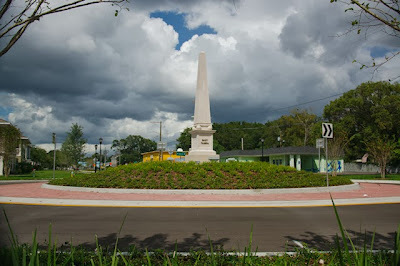 The 22nd Street roundabout features an obelisk to "welcome" folks into the neighborhood. I've visited at the obelisk, and it might be a touch too high to see around the traffic, in case you're worried about safety. They've also marked 22nd street with bike lanes, but I did not see any bicyclists in the neighborhood. However, there was a discarded diaper near the obelisk. From there, we headed up to 56th Street, since it had added some shared bike lanes. I was wondering if anyone was out for a ride. The road is well marked for the shared bike lane. 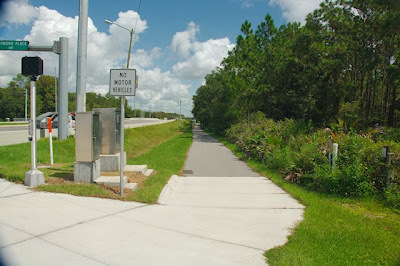 However, notice how the bike lane progressively narrows on the approach to the Hillsborough River bridge. The bike lane from the bridge and further northbound, while still marked, is totally part of the traffic lane, with no extra room for the biker. You can see how the pickup truck in front takes up the entire right lane! I would not recommend riding your bike on this stretch of road. It is unsafe by my standards. Apparently by others as well, as I did not see any cyclists that day. How are things back in Lutz? Last year Hillsborough County was considering tearing down some trees in the medians along US-41 since they were having difficulty keeping up with the landscaping. 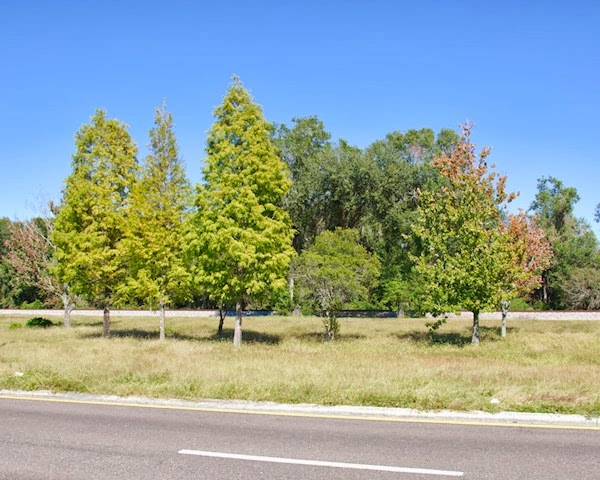 While US-41 is no where near a complete street, the County has tried to improve "livability" with the inviting landscaping, which is one of the attributes of Complete Streets. There was some public outrage, the county relented, and the trees are still are still there. 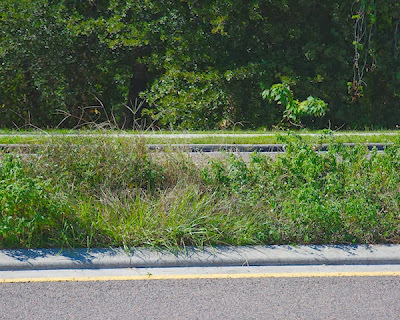 This median is looking OK, if in need of a mowing. This median is not looking so good. Just up the road about 100 yards, even worse. I know where you can get a mattress cheap! It's not like this is a bad part of town. 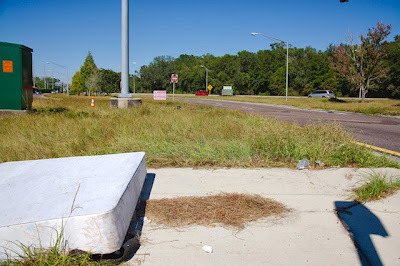 This mattress is just outside the north entrance of Avila! Arguably the most exclusive neighborhood in Tampa Bay. Looks like we'll have another meeting on Tuesday night. If they can't mow the grass, how are they going to maintain Complete Streets? If the bicyclists are not out riding, on a beautiful day, in a community with miles of good bike lanes and nearby establishments, exactly how are the Complete Streets going to work? UPDATED: Corrected references from Tampa Palms to New Tampa. How bad is Tampa's air?